The 2015 MDR SAH conference was held in Ashland, Oregon, with side trips to Medford, Jacksonville and the Oregon Caves. Friday afternoon began with a tour of Hillcrest Orchard, which is one of the oldest continuously owned family orchards in the Rogue River Valley. Our host Judson Parson, whose family has owned and operated the orchard since 1908, led a tour of the National Register-listed house, barns and outbuildings, all of which were designed by venerable Rogue River Valley architect Frank C. Clark. Hillcrest Orchard is known for its fine quality fruit and produce, quality maintained today under the guidance of the grandchildren of Reginald and Maude Bemis Parks (The Parsons family donated the historic Parsons Garden Park on Queen Anne Hill in Seattle). The evening’s festivities began at Elements Tapas Bar in downtown Medford, with a rousing talk by historian George Kramer on the history of downtown Medford and Medford’s Downtown Historic District. Kramer has worked on the restoration of several buildings in downtown Medford, including the Palm building, where the reception and talk was held. The Palm Building was built as two separate buildings and then unified by architect Frank C. Clark in 1916. The theme of the 2015 conference was “Artifice and Authenticity in Architecture! To Play or Not to Play?” in honor of our host city of Ashland, home of the 81-year-old Oregon Shakespeare Festival. Paper sessions began Saturday morning at Pioneer Hall, a 1921 building in Ashland’s historic Lithia Park. We were welcomed to Ashland by Dr. Phil Long, Board President of the Southern Oregon Historical Society. In addition to honoring our host city of Ashland, the conference theme was meant to focus attention on heritage tourism and questions of authenticity. Many of the papers and presentations addressed this theme, both directly and indirectly. Papers began with a presentation by Amy Crain, historian with the California Office of Historic Preservation. Her paper, “Synagogue Architecture as Metaphor: Standing Out or Blending In,” discussed synagogue architecture on the west coast and the variety of styles and building forms expressed in synagogue architecture. Her presentation was followed by a paper by Julianne Parse Sandlin, an instructor in the Art Department at Portland Community College. Sandlin’s paper, “The Ca’ d’Zan: Whimsical Play or Serious Business?” reflected on time she had spent researching the Venetian Gothic mansion developed by John Ringling and his wife Mabel in Sarasota, Florida. The 1926 mansion, now open to the public, was designed by New York architect Dwight James Baum. Our third paper, entitled “Authenticity and Artifice in Alvar Aalto’s Mount Angel Library,” focused on this architectural landmark in Oregon, one of three buildings designed by Aalto in the United States. It was presented by long time SAH MDR member and contributor Henry Matthews. Matthews is Professor Emeritus in architectural history from Washington State University. The late morning session kicked off with a fascinating discussion by Noah Guadagni, a recent graduate from the Master of Landscape Architecture program at the University of Oregon. His research, presented in the paper, “Ten Principles of Pacific Northwest Landscape Architecture: How Authenticity is the New Regional Commodity,” attempts to define those principles that can be found in landscapes that successfully convey a sense of local identity and culture. His paper can be found in our chapter archives at the UO Library (see links below). It was followed by the discussion of another landscape which is attempting to recover its roots, “The Weippe Prairie” by Robert Franklin, formerly with Spokane Falls Community College and now an archivist and historian at Washington State University. Next was a presentation on the Molalla Log House by retired historic preservationist Pam Hayden and historic building contractor Gregg Olson. In conjunction with their work to restore of this early log cabin, possibly Oregon’s oldest structure, they are attempting to authenticate its origins with early Russian settlers in Oregon. Liz Carter, now our regional representative from Oregon, followed up on her 2013 Elisabeth Walton Potter Research Grant with a presentation entitled, “Mid-Nineteenth Century Dwelling of Oregon Black Pioneers: A Brief Historical Context.” In conjunction with this research, Carter, an independent architectural historian, nominated the Hannah and Eliza Gorman House in Corvallis to the National Register of Historic Places. The Gormans were African American slaves who arrived in Oregon via the Oregon Trail, gained their freedom, and built a home and business in Corvallis, Oregon at a time when African Americans were not allowed to own property in Oregon. This was followed by an update and call for participants for the Society of Architectural Historians Archipedia project by Washington regional representative Phil Gruen. Gruen, who is Washington State University associate professor and director of the School of Design and Construction, undertook this effort with Robert Franklin. This challenging project will place 100 of the most significant buildings and structures from every state in an online encyclopedia that is free and available to the public. Gruen and Franklin were the recipients of a 2014 Elizabeth Walton Potter Research Award for this project. As is our usual practice, lunch was combined with the Annual General Meeting. Liz Carter was welcomed as the new regional representative from Oregon, replacing former SAH MDR president Ed Teague. One of the topics of discussion at the meeting was the location of next year’s meeting. Baker City, Oregon and Sun Valley, Idaho were discussed enthusiastically. Former SAH MDR president Martin Segger invited the membership to have their annual meeting in Victoria in 2017. More on that later. Lunch was followed by a presentation by Debra Griffith, archivist for the Oregon Shakespeare Festival, on the history of the festival and early festival buildings. Chock full of historic photos of buildings and people, this presentation offered a glimpse into the festival’s modest beginnings and many early challenges. Our next venue was downtown Ashland and the Downtown Historic District, for a walking tour led by Terry Skibby, an Ashland native and member of the Ashland Historic Commission. Skibby has been leading walking tours of Ashland for many years, and has an amazing collection of historic photographs of the town. Sunday began with a tour of the historic Jacksonville Cemetery by Dirk Siedlecki, president of the Friends of the Jacksonville Cemetery. The Jacksonville Cemetery is one of the oldest and largest in the state of Oregon, with its first burial occurring in 1859. The cemetery is the final resting place for over 5,600 residents of the Rogue Valley and continues in use to this day. This was followed by a walking tour of downtown Jacksonville by Scott Clay, Rogue River Valley native and former consultant and historic preservation planner for the City of Jacksonville. 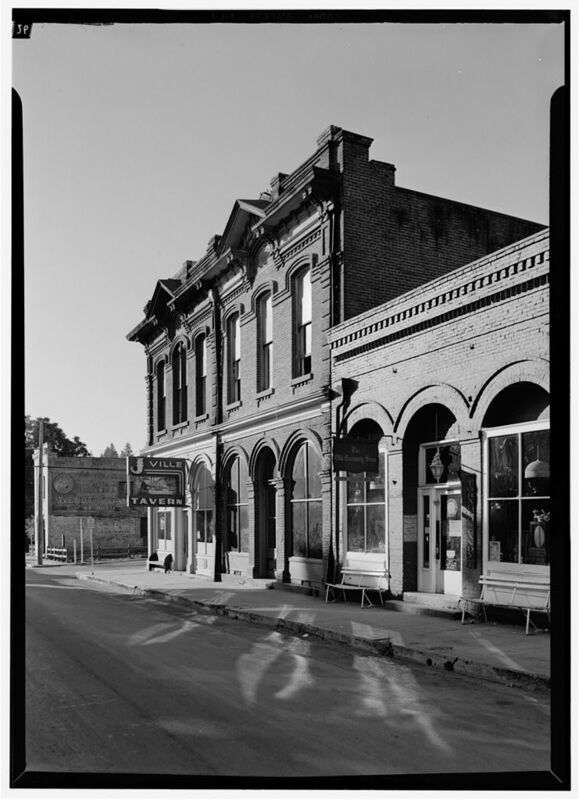 Jacksonville owes its impressive and intact architecture to the fact that gold was discovered in the area in 1851, but the town was ultimately bypassed by the railroad. The outstanding historic integrity of Jacksonville’s downtown was recognized in the 1960s, and it was designated a National Register Landmark District in 1966, the same year as the passage of the National Historic Preservation Act. The tour culminated at Jacksonville’s impressive Jackson County Courthouse, which is undergoing a restoration. The morning was capped off with lunch at the Schoolhaus Brewhaus on the Bigham Knoll campus in Jacksonville. The Schoolhaus, known historically as the Jacksonville School House, is a historic school whose ground floor is occupied by the German restaurant, brew pub and beer garden. The 1907 building was designed by Medford architect John McIntosh. After lunch, those who participated in the post-conference event headed west toward Cave Junction for an evening event at the Chateau at the Oregon Caves. The evening at the Chateau at the Oregon Caves began with a “backstage tour” of the Chateau’s renovation, led by Sue Densmore, Executive Director of the Friends of the Oregon Caves and Chateau. The Oregon Caves and Chateau is a National Historic Landmark. The Chateau sits amidst several rustic buildings and a 1938 Civilian Conservation Corps-built landscape, all of which is part of a National Register of Historic Places District. The Oregon Caves is additionally a National Monument, established by President Howard Taft in 1909. The tour was followed by a banquet for about ten of the SAH MDR members and another half dozen board members of the Friends of the Oregon Caves, which allowed us to learn more about the National Park Service-led renovation of the building. The visit culminated in a tour of the Oregon Caves on Sunday morning. So ends another year of scholarship and fellowship at the 61st annual meeting of the Marion Dean Ross/Pacific Northwest Chapter Society of Architectural Historians meeting. Stay tuned for news of a Victoria meeting in 2017! 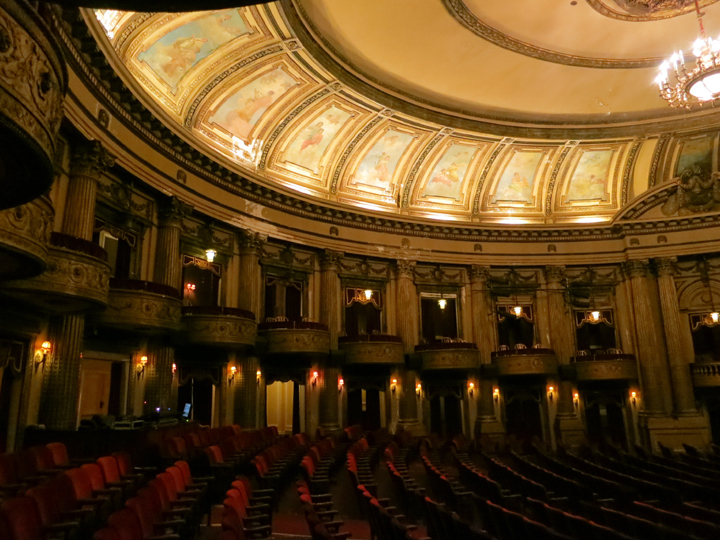 Ringling Theatre, Baraboo, Wisconsin. Architects: Rapp & Rapp, 1915. Photo by D. Pinyerd. Martin Segger just directed my attention toward the International Federation for Theatre Research (IFTR). Given that our 2015 annual meeting and conference was organized around the theme of “Artifice and Authenticity in Architecture! To Play or Not To Play?,” and the recent “Oregon Historic Theaters: Statewide Survey and Needs Assessment” by students from the UO Community Planning Workshop, I thought I’d pass along some information for the IFTR Architecture Working Group’s call for papers for their 2016 conference (13-17 June) in Stockholm, Sweden. IFTR is a truly international organization, with recent meetings in Barcelona, Spain (2013); Santiago, Chile (2012); and Osaka, Japan (2011). The broad umbrella of “Theater Research” covers a fascinating range of topics related to theater and performance. These topics are addressed by around 24 working groups which include “Samuel Becket,” “Choreography and Corporeality,” and the aforementioned, “Theater Architecture.” Like the conference, the architecture group is international, with participants from Australia, Brazil, Chile, England, Greece, Holland, Turkey, the Unites States, and Wales. 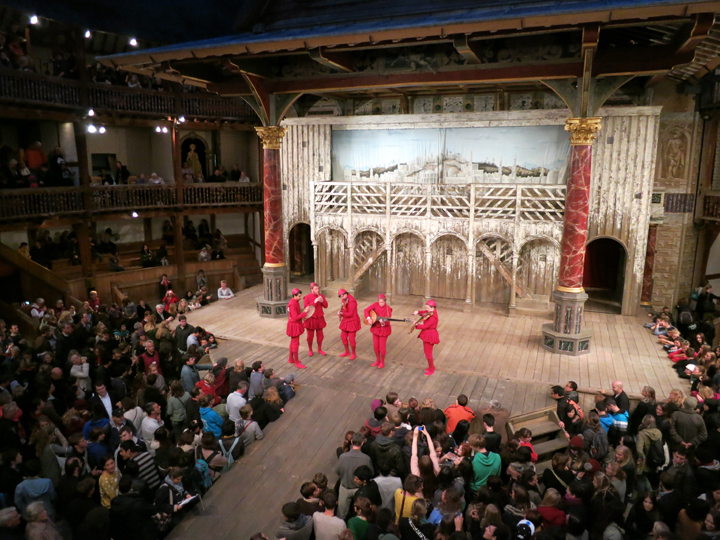 Shakespeare’s Globe, London. Architects: Pentagram, 1997. Photo by D. Pinyerd. The overall theme of the conference is: PRESENTING THE THEATRICAL PAST – INTERPLAYS OF ARTEFACTS, DISCOURSES AND PRACTICES. The Theatre Architecture Group is planning on two sessions, one addressing architecture and historiography, the other a joint session with the Scenography Working Group addressing genealogies of theatre architecture and scenography. For the former, topic suggestions include: re-readings of historical theatres in the light of developments in critical theory (e.g. spatial theory); artistic and critical practices that engage with historic theatre architectures and/or historic architectures (e.g. oral history, re-enactment, reconstruction); and theories and debates about the preservation, conservation or renovation of theatre buildings; among others. The joint session with scenography includes topic suggestions along the lines of: scenographic and architectural strategies by which performance and wider social/cultural activities have been “staged” or presented historically (theaters, concert halls, ballrooms, parks, public open space, etc. ); and strategies by which historic performances are now “restaged” (museums, historical re-enactments, “authentic” performance, revivals of plays and performances, etc.). The International Federation for Theatre Research Conference will take place from June 13-17 in Stockholm, Sweden. The deadline for financial aid/bursary applications is December 1, 2015 while the deadline for proposals is January 15, 2015. For more on the conference in general, go to http://www.iftr.org/conference. For information on financial aid go to http://www.iftr.org/conference/bursaries. For the full Architecture Working Group’s 2016 Call for Papers, click here. Jacksonville, OR. 1971 HABS Photo of the Redmen’s Lodge and Kubli Building with the Anderson & Glenn Store at the right. On Sunday, 10/25/15, Scott Clay will lead a tour of this historic gold rush town. The full program for the 2015 Annual Conference and Meeting of the Marion Dean Ross Chapter of the Society of Architectural Historians is now set. 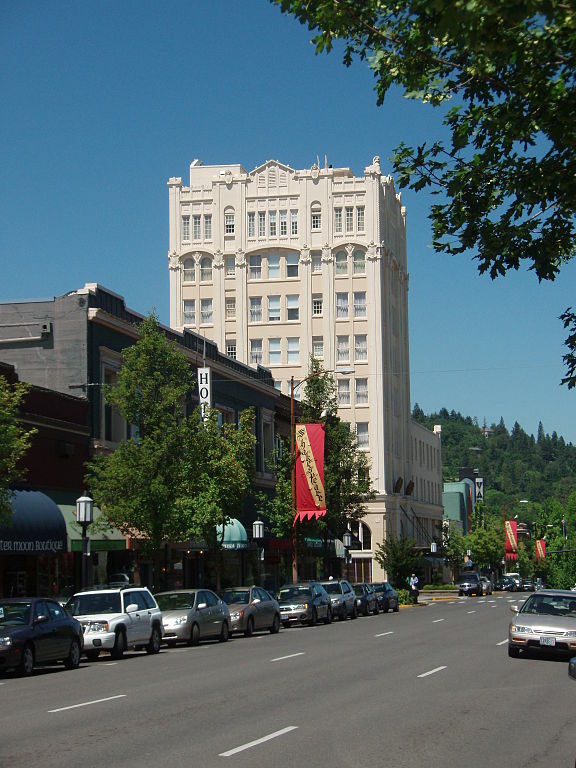 The conference’s base will be in Ashland, Oregon, with side trips to Medford-area wineries, the gold rush town of Jacksonville, and the Château at the Oregon Caves. 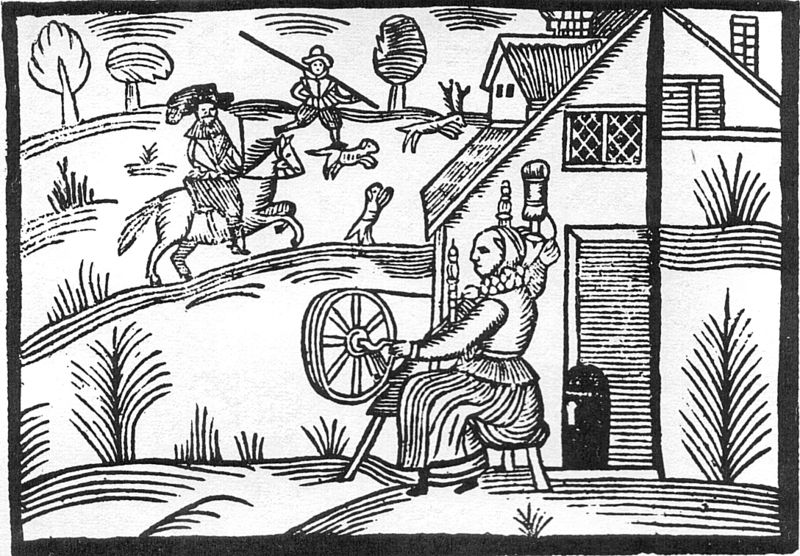 While scholarly paper sessions will cover an eclectic range of topics, local and regional history will get their fair share of attention with opening and closing keynote lectures by George Kramer and Jeff LaLande. Ashland-centric events include a walking tour lead by a member of the town’s historic commission and a behind-the-scenes look at the Oregon Shakespeare Festival Archives. The conference’s main events will take place from Friday, October 23, until Sunday the 25th. This year we’re adding a bonus attraction for Sunday, running through Monday: a backstage tour of the Oregon Caves Château, including a wine and hors d’oeuvres reception, dinner, a candlelight tour of the caves themselves, dessert and breakfast the following morning (note: attendees must make separate accommodations for lodging at the Château or in nearby Cave Junction). Discounted early registration rates remain in effect until October 7th. You can continue to register on-line (with the Eventbrite service) or by mail until October 20th. After that you can still join us by registering at the door, however we’ll only be able to accept cash or checks at that time. A full conference program with registration form is available by clicking here: 2015 Conference Program or at http://sahmdr.org/conference.html. We look forward to seeing you in Ashland and its environs! Main Street looking west towards the Ashland Springs Hotel and Varsity Theatre, Ashland, Oregon. Photo from Wikimedia Commons. Our 2015 Annual Meeting in and around Ashland, Oregon is beginning to take shape. Scheduled for October 23-25, the overall conference theme is: “Artifice and Authenticity in Architecture! To Play or Not to Play?” In a similar vein, Oregon Public Broadcasting recently ran a piece titled “Ashland: The Town that Shakespeare Built?,” that makes a strong case for the play being the thing with which to catch king tourist’s dollars. The Oregon Shakespeare Festival (OSF), currently celebrating its 80th anniversary, will still be presenting a slate of plays at the time of our conference, and while we’re too late in the season for outdoor plays presented at the Allen Elizabethan Theatre, the indoor stages will feature a wide variety of offerings including such classics as the Bard’s own Much Ado About Nothing, Eugene O’Neill’s Long Day’s Journey into Night, a world premiere play by Lynn Nottage titled Sweat, and Frank Loesser’s ever-popular musical Guys and Dolls, among others. Not to be outdone, our paper sessions, traditionally set for Saturday, will cover a range of subjects under the umbrella of our overall theme. One session will include Amy Crain’s “Synagogue Architecture as Metaphor: Standing Out or Blending In,” Julianne Parse Sandlin’s “The Ca’ D’Zan: Whimsical Play or Serious Business?,” and Henry Matthews’ “Authenticity and Artifice in Alvar Aalto’s Mount Angel Library.” Session two will include “10 Principles of Pacific Northwest Landscape Architecture: How Authenticity is the New Regional Commodity” by Noah Guadagni, “The Weippe Prairie” by Robert Franklin, and “Molalla Log House” by Pam Hayden and Gregg Olson. Many thanks to the SAHMDR’s paper selection committee for putting together such an intriguing slate of presentations. More details on additional lectures, tours, and of course banquets and get-togethers will follow soon! We hope to see you all in Ashland this fall! 2014 Conference Photos are up and running! Seattle Skyline from the Space Needle to Smith Tower. Photo by B. P. Niederer. A selection of photos from our 2014 Annual Meeting & Conference in Seattle is up and running on our Flickr page! If you’ve got pictures you’d like to add, send them to info@sahmdr.org, and we’ll post them with all due credit given! We had a great time in Seattle and a more detailed report will follow soon. In the meantime, many thanks and kudos to the organizing committee, presenters, tour guides, venues, and weather gods! It’s not too late to sign up for our 2014 Annual Meeting and Conference in Seattle this coming weekend. You can still register at the door (cash or checks only please)! For details on the schedule, click here or go to our website at www.sahmdr.org. To whet your appetite for our Seattle Conference, check out the Cultural Landscape Foundations features on Richard Haag. The offerings there include an article, Reflections of Richard Haag, Teacher and Advocate, written by Thaisa Way who will be presenting a paper on the same subject at our Conference. There is also a collection of videos of Richard Haag reflecting on his life and work as well as reflections by friends and collegaues. As part of the conference, we’ll be visiting the Bloedel Reserve, with includes some of Richard Haag’s work. If you’re still in the market for a Seattle guide book, we highly recommend the new edition of Shaping Seattle Architecture: A Historical Guide to the Architects by Jeffrey Karl Ochsner. Professor Ochsner will also be presenting a paper on the emergence of Northwest Regional Modernism during our Saturday paper sessions. 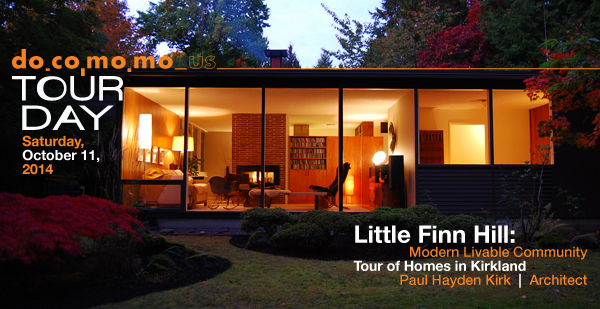 If you’re still in the Seattle area during the weekend following our Conference, you may want to check out the Docomomo WEWA tour of Little Finn Hill, a modern livable community in Kirkland with houses designed by Paul Hayden Kirk. Tour five Paul Kirk-designed houses! Docomomo WEWA invites you to join us for Docomomo US Tour Day 2014! The Little Finn Hill neighborhood in Kirkland, Washington is home to a collection of modest, mid-century modern residences designed by revered Northwest architect Paul Hayden Kirk and built for developer Richard G. Robinson in 1954-1955. Docomomo WEWA invites you to explore this community of livable homes that was once prominently featured in Life and Sunset magazines in the 1950s. 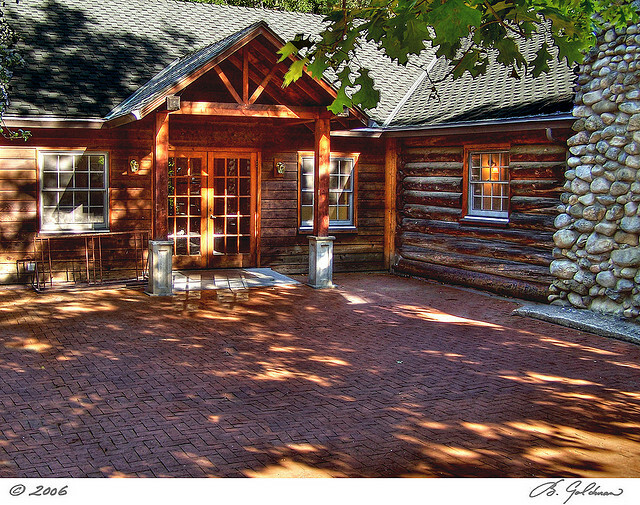 One of the houses on the tour was featured in Pacific NW Magazine in 2012. Five houses on the same street (NE 113th Place in Kirkland) will be open to view. They are variations of the same plan but each house is different enough that you’ll see how the architect’s creative use of details and siting gave each home a different feel. With this event, we celebrate the 100th anniversary of Paul Hayden Kirk’s birthday in 2014. We thank the homeowners for graciously opening up their residences and helping us plan this event. If you find yourself in other cities on Tour Day, we encourage you to attend one of the other great tours. Learn more about Docomomo US Tour Day 2014. TICKETS: Please purchase tickets online through Brown Paper Tickets. The cost of tickets for the general public is $15 ($16.52 with service fee) each. For Docomomo US members, tickets are $10 ($11.34 with service fee) each. Tickets may also be available at the door the day of the event ($15 for all). If you are not a Docomomo US member, we encourage you to join today. If you join, you may purchase tickets for this event and future Docomomo WEWA events at the discounted member price. Membership in Docomomo US means you also become a member of the Docomomo WEWA chapter. WHEN: Saturday, October 11, 2014. The tour is an open house format from 1:00 to 4:00 pm but please arrive by 2:30 pm to check in so you have time see all five houses. The tour is self-guided. You’ll receive a tour booklet at check in. WHERE: Please check in at the house at 10429 NE 113th Place, Kirkland, 98033. On-street parking available. Please do not park in or block driveways. OTHER INFO: For each house you’ll be asked to either remove your shoes or wear shoe covers (provided). Exterior and interior photography permitted for personal use only. Please respect each property and do not open doors, cabinets, and drawers or go into any rooms that are not open to view. Backpacks and strollers are not permitted inside the homes. Small children must be with an adult at all times. Bathrooms in the homes will not be available for use. This event is supported in part by a 4Culture Preservation Sustained Support grant. Thank you 4Culture!